Sleek MakeUP’s legendary i-Divine palettes are 12 shades of super-pigmented, long lasting, mineral based eyeshadow, designed to suit all. Each i-Divine contains pearlescent shades, which contain mica particles that highlight and illuminate giving an overal radiant effect. For the best result, please ensure to use primer before applying any makeups to create a smooth base that makeup can stay on well to your skin for long lasting effect. Acid contains a fusion of vibrant colour for the more daring. With a hyper bright pink to neon green and yellow amongst the 12 shades. Each shade can be worn alone for a dramatic look or mixed for a colourful rainbow effect. Au Naturel is an array of matte and shimmery eye shadows providing a subtle yet contoured effect for day, that can be built up for a gorgeous evening smoky effect using the velvety browns and shimmering fawns. Bad Girl is the ultimate palette for classic smokey eyes, containing strong shimmery blues and deep matte shades of green and purple. This is a smoky lovers dream, ideal for creating either sophisticated or sensual dark eye looks. Oh So Special includes ultra flattering pink and brown shades that will deliver perfect results no matter the occasion. Take your look from day time chic with matte browns and creamy beige, through to a sultry evening look with shimmering greys and smoky plums. The Original contains a variety of highly-pigmented metallic colours, ranging from bronze to purple, allowing you to create endless shimmery looks fit for day or night. Primer is a palette of 12 coloured eye primers perfectly designed to be used with all Sleek MakeUP eye shadows and pigments. It is a light cream formula that intensifies shades giving the truest colour pay off, providing a good base prolonging the wear of your eye makeup look. 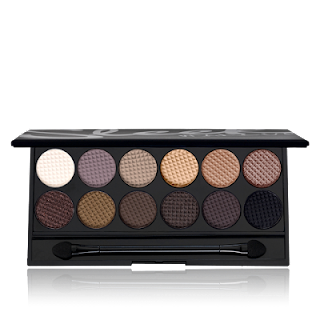 Showstoppers features twelve of Sleek MakeUP’s legendary eye shadow shades from previous palettes. Each shade is known for its supreme pigmentation, bold colour and spectacular finish, this palette is for totally show stopping eyes! Snapshots will keep a little bit of summer in your life all year round, with a rainbow array of matte purples and shimmery blues. Perfect for subtle daytime pops of colour or glistening evening eyes. Sunset shades represent the sun, sea and sand. With a blend of shimmering golds, reds and blues, this palette is perfect for that sun-kissed look. To create warm eyes apply your desired shade over the entire eye lid and lightly across the lower lash line. Ultra Matte V1 Brights are intensely creamy and super blend-able. Due to the intense colour, a little goes a long way. With cobalt blue and canary yellow neon shades these are ideal for creating strong vivid eye looks. Use as a liner along your top or bottom lash line for edgy colourful eyes. Ultra Matte V2 Darks are creamy and super blend-able. Due to the intense colour, a little goes a long way. The browns, blues and purples ideal for contouring and creating intense eyes. The light creams and whites are also perfect for highlighting inner corners or your brow bone.